When you land on the island, you’ll be in main street. 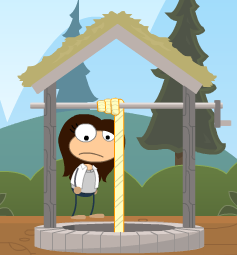 Go all the way right, and go to Early Poptropica. 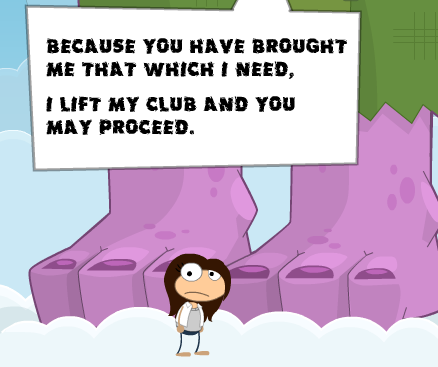 Talk to a few of the Poptropicans, and you’ll get the gist pretty quickly. Three of the town’s possessions have been stolen: a pig, a water bucket, and a signal flag. There will be a well toward the right. Go down the well, and you’ll be in the storage cavern. Go left until you fall off of the platform, and you’ll land on a green platform that acts as a sort of seesaw. Go left more, until you land on another green platform. Go left and under the platform, and there will be a boy with a snorkel standing there. Click on him, and he will tell you that there is a glow stick up to the left of the cavern. Jump on to the sliding platform to the left, then back onto the green platform. Stand in the middle, and jump onto the next green platform up and to the left. From there jump onto the normal brown platform to the left, and up until you see the glow stick. Collect it. Now exit the storage cavern the same way you came. Go back to main street. Go right, until you see the manhole directly under your blimp. Go down the manhole. You will be in a place called the pit. Make your way to the bottom of it, staying toward the right as best as you can. 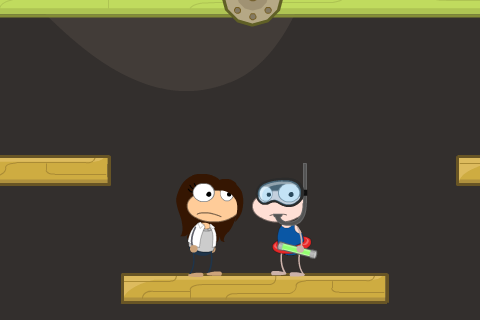 To the very right of the bottom, there will be the pig that the Early Poptropicans are missing. Go to the left, being careful to avoid the giant spider. Go to the next area. You are now in the dark room. Go all the way left, until you come across a rope. climb the rope and go right. There will be another rope directly after; ignore it. Go all the way right, and climb the rope next to the wall. Go left, and climb the next rope. Go left again, and there will be a golden egg. Collect it. Now go right, and climb the next rope that’s nearest to the wall. Go left and climb the next rope. Go left more, past the next rope. Climb the rope closest to the left wall. Go left, and there will be a rope that leads out of the dark room. Go up. 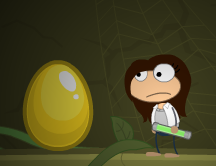 You will emerge in Poptropica Towers. Jump onto the clothesline directly above you. From there, jump onto the next line, and onto the building to the left. 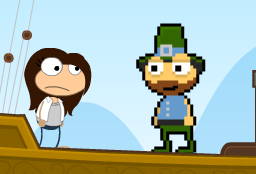 Go left, and fall off of the building onto the poptropican statue. If you miss, you can just start the process over again. From the statue jump onto the red tower, and onto the clothesline to the left. Keep jumping until you are high enough to land on the top of the blue tower. There will be a vine, which leads upwards. Climb the vine. Go right, and there will be the purple feet of a giant and his club will be preventing you from going any further. Click on him, and you will give him the golden egg. As he says, since you gave him the egg, you may now go further. So go right, and into the next area. You will be in a giant vegetable patch. Climb up the gardening tool and the vine, until you fall off of the vine. Then climb over the fruits and vegetables, and the water bucket will be sitting there. Collect the water bucket and go right. You will be in the aircraft graveyard. Go right, and use the air coming from the fans to float over the nose of the plane. Do this again over the rocket ship. On the other side of the rocket will be a jet pack. Collect it, put it on, and go back to the vegetable patch. Go left and fly over the shovel, careful not to fly over the vine also. There will be a hole in the clouds. Go down the hole, and you will land on top of the water tower in main street. The signal flag will be to the right of you. Collect it, and go back to Early Poptropica. Go right, and talk to the man next to the fence. You will give him the pig. Now keep going right, and talk to the next man. You will give him the water bucket. Go a little further and up the rope to the tower. Talk to the man there and you will give him the signal flag. He will raise the flag, and a ship will come in. Get off the tower, and go on the ship and talk to the man on it. He will give you your medallion.